← Tying Up The Middle Ground During the Dog Days. THE Grill and the Book That Shows You How. Mr. Grove’s incredibly useful book. For most people, summer is grilling season. I tend to look at a good grill as an extension of my kitchen. Particularly if I’m going to cook something that will generate an awful lot of smoke. I’m most happy to report that my Big Green Egg, a kamado style grill, is a luxury to which I’m rapidly becoming accustomed. It is truly an engineering marvel and makes grilling, smoking, searing, and baking easier than it should be. But, I am no master of the grill. 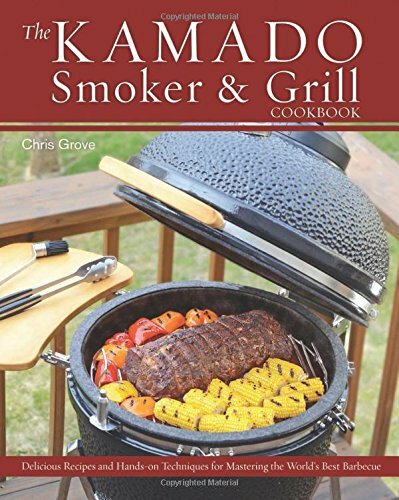 Thankfully, the nice PR people sent me The Kamado Smoker and Grill Cookbook: Recipes and Techniques for the World’s Best Barbecue to review and, combined with the forums, my meals are turning out better than ever. Easy to read, enjoyable to put into action, Mr. Grove’s book is THE one to buy if you dive into the ceramic grill world. Go check out his writing on his blog: NibbleMeThis.com and try to resist the siren’s call of cooking in this ancient and wonderful way. This entry was posted in Entertaining, Living, Uncategorized and tagged Big Green Egg, ceramic grills, Chris Grove, grilling, kamado grills, Nibblemethis.com, recipes. Bookmark the permalink. 4 Responses to THE Grill and the Book That Shows You How. This is my year to start grilling beyond just using my small Weber. I will look at these grills before I buy something. Thanks Chris. I just forwarded your post to a friend who loves his egg. He made fantastic grilled pizza on it last weekend that will be hard to beat. The crust tasted exactly like it was made in a brick oven, so I can see where the egg may be a terrific alternative to the expense of building a brick pizza oven outdoors. Have a great weekend! xo, N.
TLL, thanks! He’ll really appreciate the book. What a game changer for me.